7031 1033/67 Year 1980 complete in the mint never hinged original sheet without Michel no. 1037 / 38 and 1065, with plate flaw 1047 I, in perfect condition mint never hinged Michel 1726,- €. 7032 1065Abart 60 Pfg. 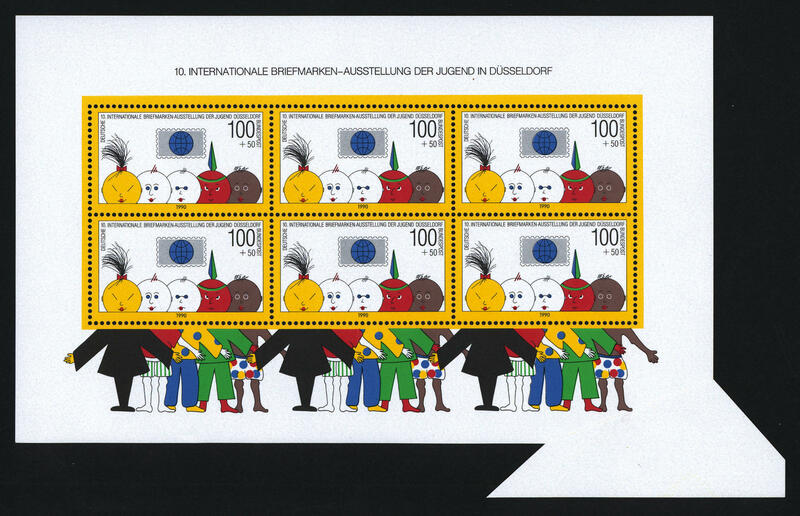 Philatelist association 1980, miniature sheet to ten values with strong oversized about 8 mm, unfolded, in perfect condition mint never hinged scarce variety! Michel mentions, however unpriced listed. (see Michel special page 1018). 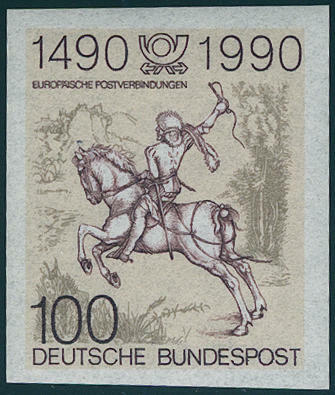 7033 1082/1117 Year 1981 complete in the complete original sheet, in perfect condition mint never hinged Michel 1780,- €. 7034 1097G 60 Pfg. 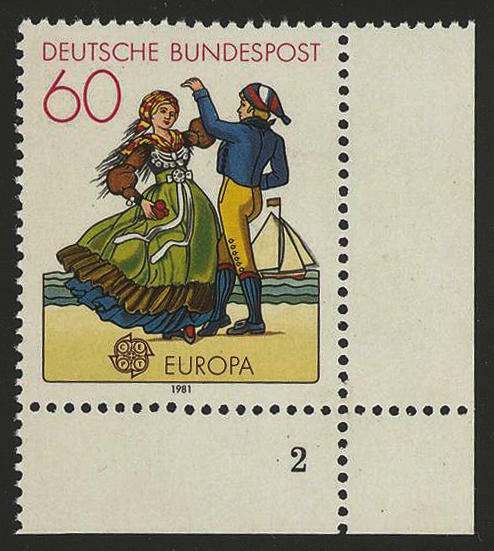 Europe 1981 with very rare variety \"printed on the gummed side\" from of the right lower corner of the sheet with printing number 2, unfolded, in perfect condition mint never hinged these anyway scarce variety places with printing number a rarity of the Federal Republic dar, probable even unique! Photo expertize for former block of four Schlegel BPP. 7035 1097G 60 Pfg. Europe 1981 with very rare variety \"printed on the gummed side\", in perfect condition mint never hinged by Michel undervalued! Twice signed Schlegel BPP. 7037 1146P 80 Pfg. 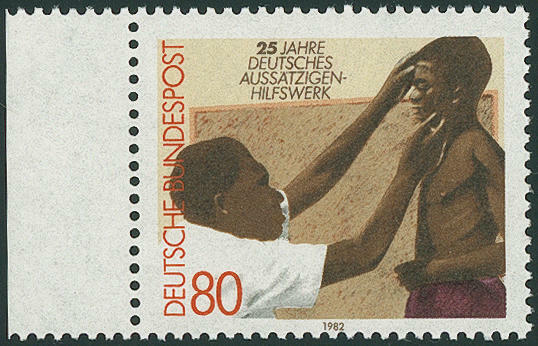 German lepers auxiliary work 1982, the scarce proof from left margin, in perfect condition mint never hinged, photo expertize \"in perfect condition\" Hans-Dieter Schlegel BPP. 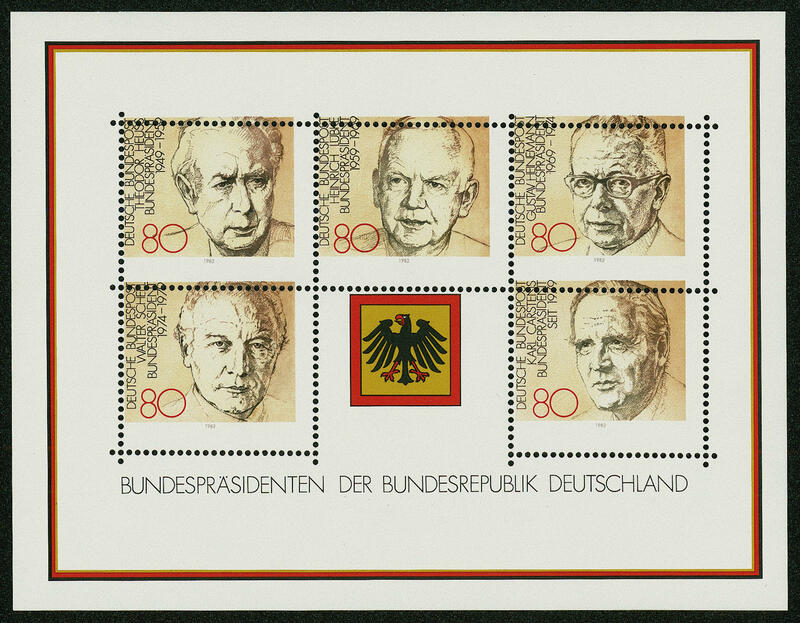 7038 Bl.18Abart Presidents of the Federal Republic souvenir sheet 1982 with extremely strong defective or badly placed perforation, in perfect condition mint never hinged a very distinctive and extraordinarily scarce variety! Photo expertize Schlegel BPP. 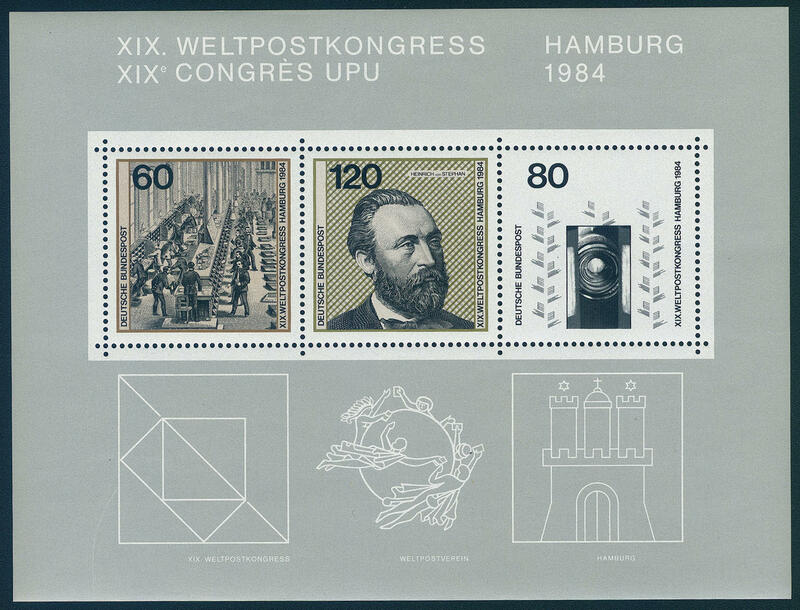 7039 Bl.19F World postal service congress souvenir sheet 1984 with very rare variety \"at the 80 PFG. All colours except black, at the 120 PFG. The colour medium chrome yellow missing\" fresh colors and in full original size, in perfect condition mint never hinged there are only few examples from this known. By Michel catalogue clearly undervalued! Photo expertize \"the condition is perfect\" Schlegel BPP. 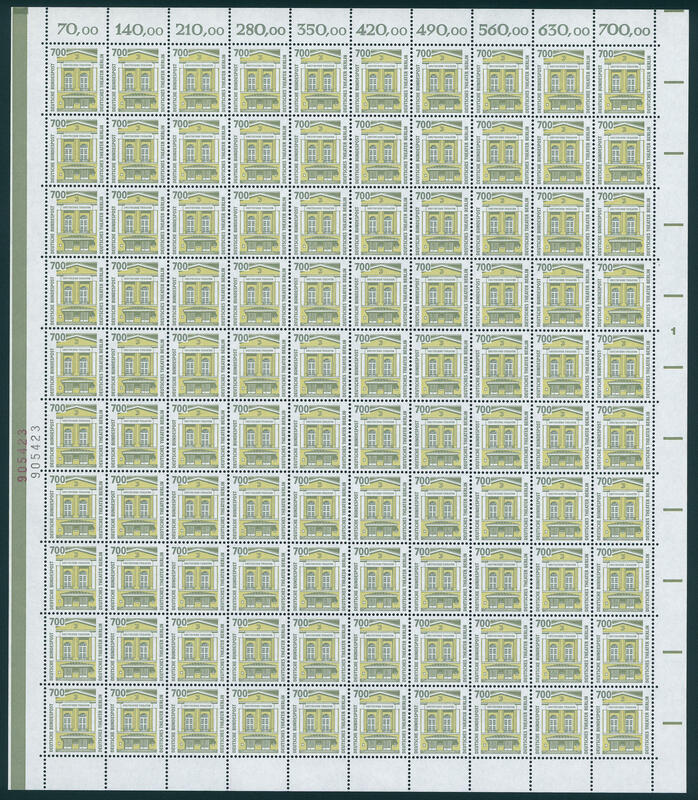 7040 1223G 80 Pfg. Schleswig Holstein canal 1984 with rare variety \"printed on the gummed side\" from left margin of sheet, in perfect condition mint never hinged, photo expertize \"perfect quality\" Schlegel BPP. 7041 1232F 60 Pfg. Anti smoker campaign 1984 without impresssion of the value from left margin of sheet, in perfect condition mint never hinged a very scarce variety! Photo expertize \"the condition is perfect\" Schlegel BPP. 7042 1232F Anti smoker campaign 1984 with rare variety \"colour dark rose red numeral of value) missing\", from left margin of sheet, in perfect condition mint never hinged, photo expertize Schlegel BPP. 7043 ∆ 1233U 80 Pfg. 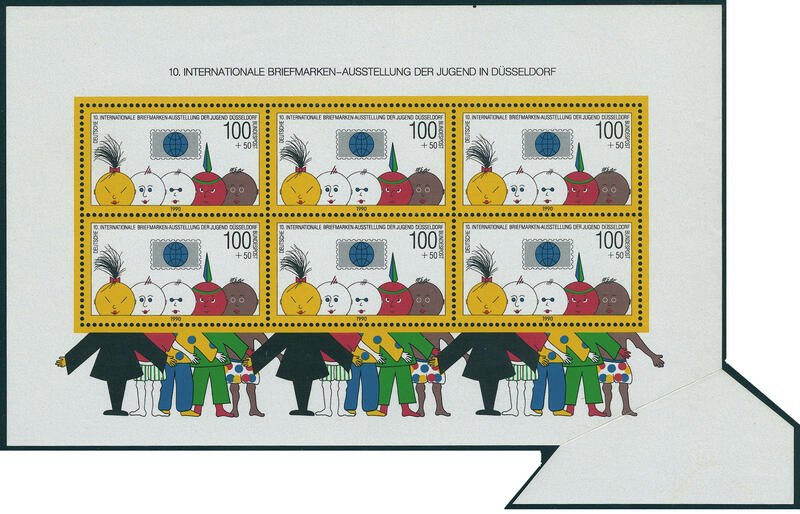 Christmas 1984, 4 sided with wide margins unperforated on white letter piece perfect used \"FRANKFURT\". Spectacular variety, by Michel unknown and possibly unique! 7044 ∆ 1241U 80 Pfg. 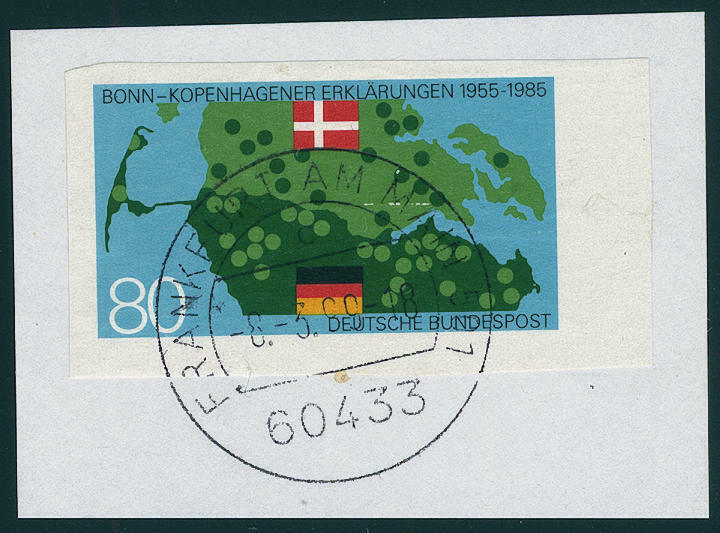 Bonn Copenhagener Explanations 1985 four sides with wide margins unperforated on very nice white letter piece, perfect used \"FRANKFURT 8.3.99\". 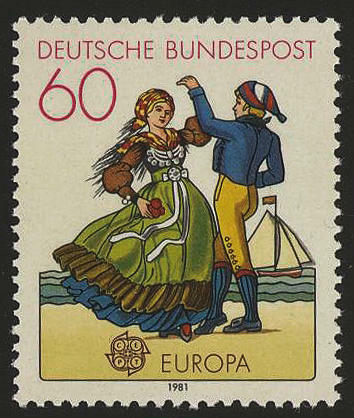 There are very few examples from this known, the to the rarities of the modern philately count. Photo expertize Hans-Dieter Schlegel BPP. 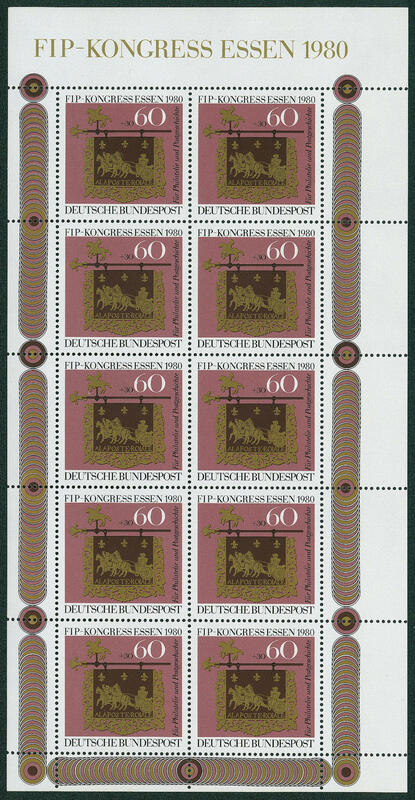 7045 Bl.20Abart Democracy souvenir sheet 1986 with extremely strong sheet miscut from 3 cm, through it printing and perforation vertical about 3 cm shifted, in perfect condition mint never hinged the inscription is therefore above in lieu of at the bottom. Very decorative and scarce variety, of the only a few copies became known are! Photo expertize \"the condition is perfect\" Schlegel BPP. 7046 1339/1691ex Sights 1987 / 93, all 27 values in complete original sheet, unfolded and in perfect condition mint never hinged the pure post price amounts already 4390,- DM! Michel 7310,- €. 7047 1445U 100 Pfg. Postal service connections 1990, four sides with wide margins unperforated, in perfect condition mint never hinged photo expertize \"the condition is perfect\" Schlegel BPP. 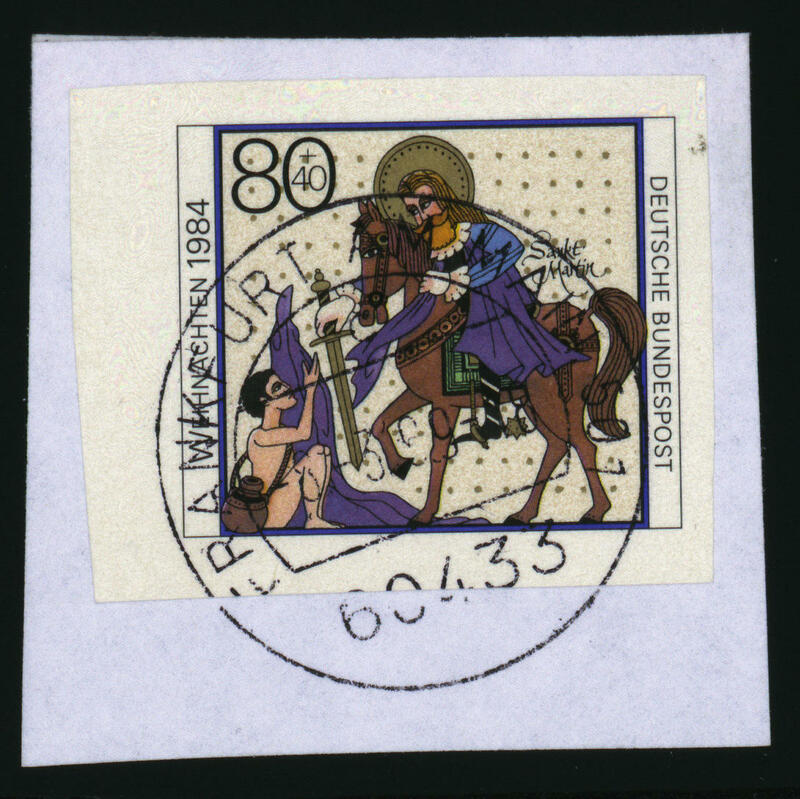 7048 Bl.21Abart Youth block 1990 with extraordinarily distinctive miscut through sheet fold, through it at the bottom on the right with additional attaching white paper part, fresh colors and in perfect condition mint never hinged an especially attractive and in this kind extreme scarce variety! 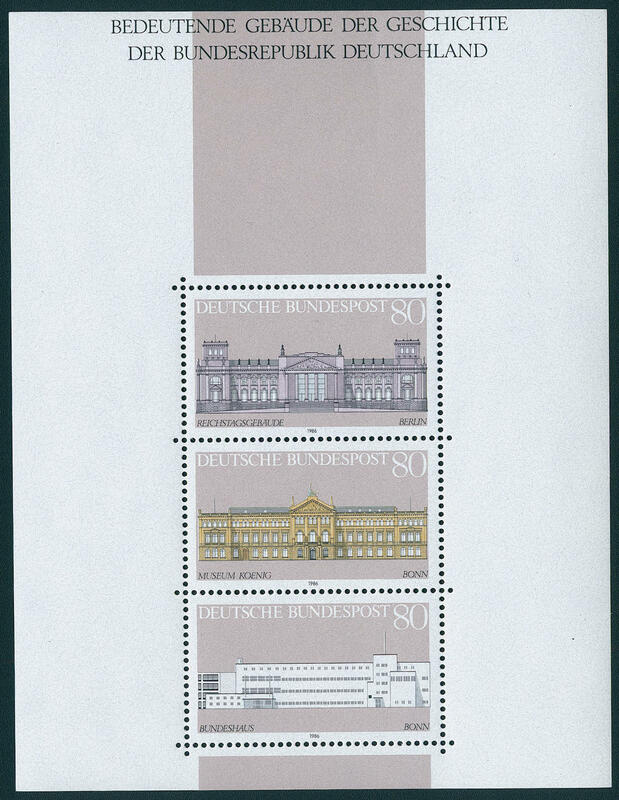 7049 Bl.21Abart Youth souvenir sheet 1990 mint never hinged, minimal stick, through incorrect cut at the bottom on the right with large attaching paper part. Very decorative and by of this issue extremely scarce variety! 7050 1481IPa 50 Pfg. 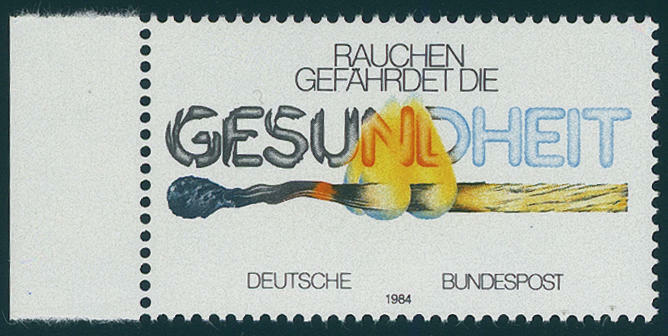 Berlin wall 1990, vertical strip of five from left margin of sheet, as well the lower pair with sensational variety \"glued paper web\" with blue line, in perfect condition mint never hinged a large varieties rarity of the Federal Republic also in the Michel special catalogue unlisted. Expertise Schmidl.